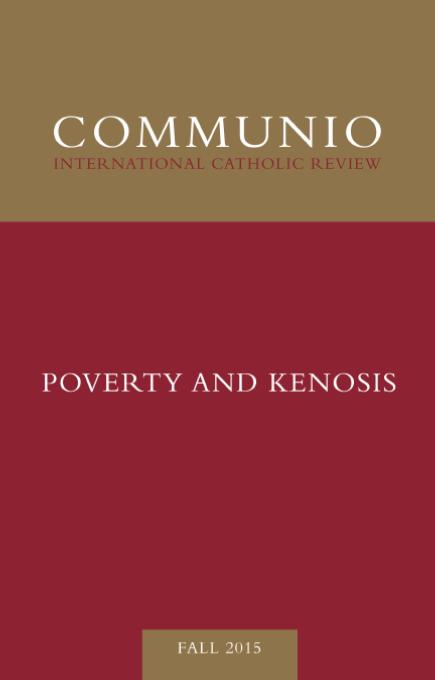 The Fall 2015 issue of Communio is dedicated to the theme of "Poverty and Kenosis." Christ in his kenosis is not simply an example to follow; he is the Son, whose filial attitude is given through communion with those who believe in him. Before God we are all poor beggars seeking to take advantage of the divine profligacy. Christ’s revelation of God’s triune love shows how seriously God takes his creatures’ thirst for unity. The first of all philosophies, even before the thinking of being as being, is the philosophy of love. Franciscan poverty became the starting point for a mendicant order unlike any monastic order that had previously existed. At the heart of [the debate] lies the question of poverty, property, and the issue of the coherence of pure usage without right, or of a right against right to such usage. If the Church were to reject Israel, she would be guilty of rejecting her own mother. The Church is the continuation of Israel, and the eschatological change Israel experiences in the process is a renewal rather than a termination of its covenant-identity. The Torah of the New Testament is the very person of Christ whom we can follow only by the power of the Holy Spirit.